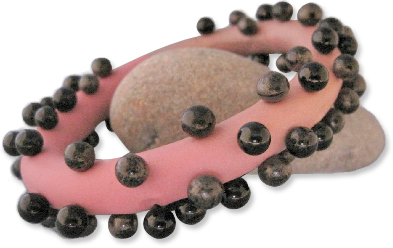 Sylvie Peraud’s prickly polymer bangle was one of the top vote getters in the Crazy Bracelets challenge sponored by France’s LezArtGil group. Scroll down the LezArtGil page to reveal all the wild entries. The theme was inspired by Donna Kato’s signature fluid bangle shapes and her recent workshops. The second bumpy bangle is from Connecticut’s Helen Wyland-Malchow. She’s a winner in the Progress and Possibilities competition. Click through her noisy Web site to see the full range of her work. Many thanks annoucing new works and pictures of Donna!!! So funny bangles and rings that we could easily wear this summer! The noisy web site is playful and great things can be discovered there! Fun stuff. Helen has even more of those fun bangles. Congratulations, Sylvie! Your bangle is beautifully made, but you can do terrible damage with those points!! Alison is right, this bangle has a lot to do with a weapon !!!! So much talent in one place. Sylvie’s bangle looks like an angry sea creature. I’m making a bow to Sylvie’s sculpture-bangle. Honestly, this IS what ART is, isn’t it?